Synergy between Theory and Experiment as Applied to H/D Exchange Activity Assays in [Fe]H2ase Active Site Models (J.W. Tye et al.). Electronic Structure and Spectroscopic Properties of Molybdenum and Tungsten N2, NNH, NNH2 and NNH3 Complexes with Diphosphine Coligands: Insights into the End-On Terminal Reduction Pathway of Dinitrogen (F. Tuczek). Quantum Chemical Investigations into the Problem of Biological Nitrogen Fixation: Sellmann-Type Metal-Sulfur Model Complexes (M. Reiher, B.A. Hess). Proton and Electron Transfers in [NiFe] Hydrogenase (P.E.M. Siegbahn). Heterolytic Splitting of H-H, Si-H, and Other s Bonds on Electrophilic Metal Centers (G.J. Kubas). Tetrapodal Pentadentate Nitrogen Ligands: Aspects of Complex Structure and Reactivity (A. Grohmann). Efficient, Ecologically Benign, Aerobic Oxidation of Alcohols (I.E. Markó et al.). Visible Light Photocatalysis by a Titania Transition Metal Complex (H. Kisch et al.). 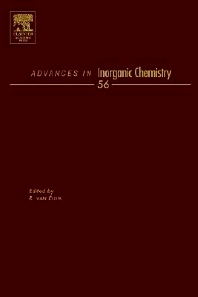 Inorganic Chemists, Organometallic Chemists, Bioinorganic Chemists.